Join us for a peek behind the curtain as we show you some behind the scenes fun and games from Sally McLean’s episode for Season One of Shakespeare Republic. Choreographed production conversations (seriously, Sally and Shaun were seriously in synch a few times – they nearly do accidental jazz hands. No, really! 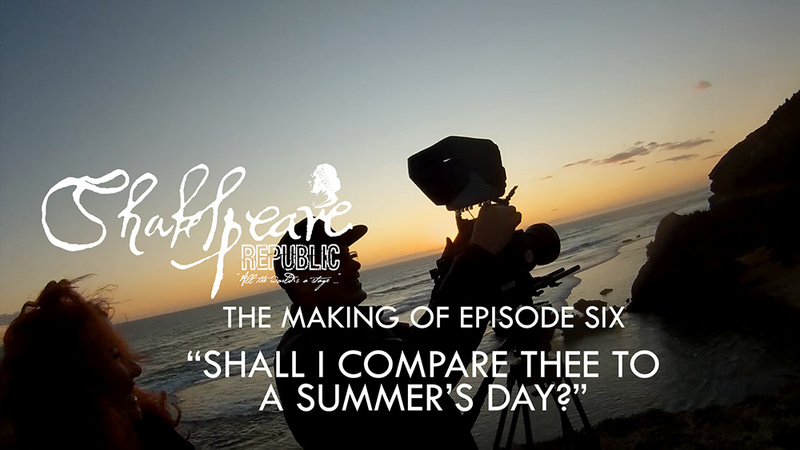 ), the joys of filming outdoors in 25 kph winds and the bittersweet feeling knowing this is the last Shakespeare Republic episode for the moment – all this and more in this behind the scenes look at what goes on off camera and off script. This is the final video of Season One of Shakespeare Republic. We know, we’re a bit sad too. But make sure you Subscribe to our channel to ensure you don’t miss any of our other planned content coming up in the not too distant future! You can also sign up to our Newsletter to get advance notice of what we are up to next, before it goes public. Thank you to all our viewers, subscribers, followers and “likers” – we have truly enjoyed bringing this first season to you and look forward to seeing you all at the launch of Season Two! Posted On 05/10/2015 in Behind The Scenes, Video with 0 Comments.Tagged: behind the scenes, billy smedley, making of, sally mclean, shaun herbertson, tim mccormick.